Recent experiments have shown the existence of quantum coherence in energy transport phenomena occurring in photosynthetic complexes. These findings came as a surprise since the presence of quantum effects was not expected at room temperature, in a system highly coupled to its environment. Several theoretical works trying to understand and justify the presence of these quantum coherences have followed and models have been developed which predict that the interaction with the environment leads to an improvement of the energy transport efficiency [M. Mohseni, Y. Omar, G. Engel, M. Plenio, Quantum Effects in Biology, Cambridge University Press (2014)]. In the article Disorder-assisted quantum transport in suboptimal decoherence regimes published in Scientific Reports, L. Novo, and Y. Omar from the Physics of Information and Quantum Technologies Group at Instituto de Telecomunicações, together with M. Mohseni from the Google Quantum Artificial Intelligence Lab, studied a model for quantum transport in certain highly symmetrical structures which captures the essencial features of the interplay between symmetry, static disorder and decoherence. They found that purely quantum dynamics leads to very low energy transport efficiency in a highly symmetrical structure due to destructive interferences. Static disorder as well as decoherence lead to an improvement of transport efficiency and the authors explore all the relevant range of parameters to find the conditions that optimize this quantity. Interestingly, it was found that when decoherence is suboptimal for transport, static disorder can improve significantly the transport efficiency. 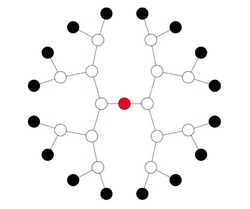 to the root of the tree (in red) is enhanced by the presence of disorder and dephasing. Although several works have explored the role of decoherence for improving quantum transport, this work goes deeper in the study of how static disorder can be a useful tool for the same task. These findings can possibly be used in the engineering of more efficient nanoscale devices for light-harvesting.